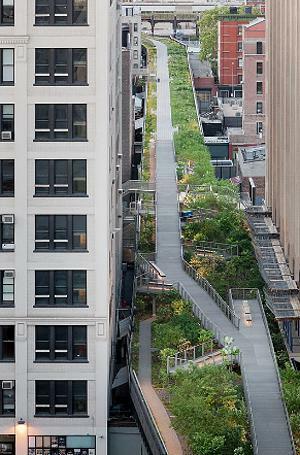 NEW YORK, New York, June 8, 2011 (ENS) – “Where there was once a decaying stretch of elevated freight tracks, there is now a beautiful park that draws visitors from around the world,” rejoiced Manhattan Borough President Scott Stringer on Tuesday. Stringer was speaking at the opening of the second section of the High Line, a public park built 30 feet above the streets of New York on a 1930s-era elevated freight rail line. The opening of the second section doubles the length of the public park. Traveling mid-block between 10th and 11th Avenues, the new section provides a new kind of urban experience, carrying visitors in close proximity to historic buildings and warehouses, and introducing unique views of the cityscape and architectural landmarks, including the Chrysler Building, the Empire State Building, and the New Yorker Hotel. Like the first section of the High Line, the design of the new section is inspired by the wild, self-seeded landscape that grew up naturally on the High Line when the trains stopped running in 1980. The design retains the original railroad tracks from the industrial structure and restored steel elements including the High Line’s signature Art-Deco railings. An integrated system of concrete pathways, seating areas and special architectural features blend with lush lawns and naturalistic planting areas to create a singular landscape that is fully wheelchair accessible via elevators. The High Line design is a collaboration between James Corner Field Operations, the Project Lead; Diller Scofidio + Renfro, and planting designer Piet Oudolf, with support from consultants in lighting design, structural engineering, and many other disciplines. 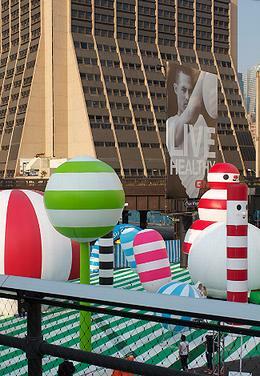 The design team was selected through a competition held by the City of New York and Friends of the High Line in 2004. “Since the opening two years ago of section one, the High Line has emerged a must-visit destination for millions of New Yorkers and visitors,” said Parks and Recreation Commissioner Adrian Benepe. The remaining one-third of the High Line wraps around the Hudson Rail Yards, between West 30th and West 34th Streets. Overgrown with wildflowers and grasses, the final section is owned by CSX Transportation, Inc. In 2010, the City of New York completed the public land-use approval process to acquire this final section of the High Line, and is working with CSX and the underlying property owners on agreements to allow for public access to the High Line at the rail yards. At the ribbon cutting ceremony for the second section on Tuesday, Mayor Bloomberg announced The Tiffany & Co. Foundation has pledged $5 million to launch of the Rail Yards Challenge, and long-time supporters of the High Line, Donald Pels and Wendy Keys have pledged an additional $5 million to double the challenge grant. Part of the Campaign for the High Line, the Rail Yards Challenge is a fundraising effort by Friends of the High Line to help drive the transformation of the final section of the High Line into public open space.